This is my post on how to chalk paint furniture. If you can’t see the full version and video, click here. A couple of years ago I painted a fabric armchair my nanna was planning to throw out. The video has been pretty popular with about 100,000 hits on Youtube so far. I had looked into getting it reupholstered, as it was beyond my upholstery skills. I discovered though that it would cost more than the chair did originally! Painting it was incredibly satisfying. It did take a while as you have to wait for each coat to dry, but it was definitely worth it. The chair now takes pride of place in my bedroom. One thing you all seem to want to know though is how it’s bearing up after two years of general wear and tear. So, I thought I’d do a little bit of an update for you. So this is the chair in question. I’ve added a nice colourful cushion I made as well and as you can see it’s in pretty good order. Now bear in mind that my daughter uses this as a playground pretty much every day. She jumps on it, slides on it, scratches the surface. So really, considering all that, it’s done pretty well. Unsurprisingly, there are a couple of scuff marks. My plan is to just paint over them when the monkey grows up and actually learns how to sit on her bottom. If I’d reupholstered it in pale grey fabric it would have been severely marked and probably stained and would need redoing already. One thing everyone asks is does it leave chalk on my bottom? Imagine how precious I’d have to be about people not sitting on it in dark clothes! The wax I used at the end stopped any chalky excess and also sealed it. Now this does mean that for some the look is a little too like leather. Actually although it’s not soft like fabric, I still think it looks inviting. If you have any tears on the fabric before you paint it you’re obviously not going to be able to hide these. This chair had some damage on one of the arms, I think where my nanna’s cat had nibbled it, and although I’ve obviously painted over that, it is visible. I feel it’s less noticeable than before though. So the chair is doing well, meanwhile the creases on my face from dealing with a toddler the past two years… not so much! What I love about how successful the video has been is that there will be many armchairs out there given a new lease of life, rather than being sent to landfill. If this has inspired you to do the same, and you want to know how to chalk paint furniture, check out my tips in the original post here. There are some amusing outtakes you can watch as well! If you want to have a go at reupholstering something instead – how about a chaise longue? Hi there! 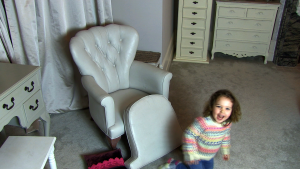 I’ve just found you through your first video of painting the gorgeous armchair! I’m now subscribed (and have a new gal crash haha)! One question I have is does it FEEL like leather or is it still sort of soft? I worry it could be like sitting on crinkly paper??!! I’m in Australia and have just resigned from teaching due to total burnout so am looking to start up cycling furniture as a hobby!! Thank you kindly, you’re so fab! Lovely to have you on board Lucy! It definitely isn’t like sitting on crinkly paper!!! It’s a bit like leather, but not quite the same – hard to describe. What I would say is I’ve had varying successes and when there’s a deeper pile I wouldn’t paint it now – unless it was to save it from going to landfill. When you start definitely do a tester patch where you won’t see it if you change your mind, but woven, low pile fabrics work the best. PS Crush/crash – I’ll take a compliment wherever I can get one! 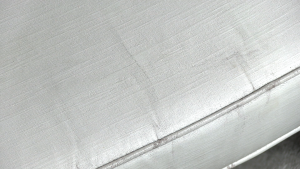 The Ronseal Interior wax does not come in clear – I have bought the one you recommended; White Ash. How much will it affect the colour of the chalk paint – I’ve used Midnight Blue. Thanks. Hi Jane. The white ash does have an impact on the colour – in a way that I personally really like (ages things slightly, and takes the edge off a little). However, it may not be to your taste. My best advice would be to paint some of the chalk paint onto something you can throw away, and then try the wax. The impact on the colour is going to be very similar regardless of the material, so it doesn’t matter if you can’t match exactly I don’t think. I hope that helps. Would love to know if you’re happy with how it turns out. Let me know! Thanks for reply. I went ahead and painted the wax onto my chair, and as you say, the white ash does bring the colour down a little, but with an ageing effect, which I liked. The look of the chair is great, but the material has gone a little hard and is more like a leather effect. If I try it again, I think I would use a traditional tinned wax that you have to rub in and buff up; the paint on wax you recommended is easier to apply and no buffing required, but I do think this is what made the material harden. Thanks for video – it did inspire me to give it a go. Oh, wow – thank you for saying that. That is lovely. I’m glad you like the look of the chair. You’re right, there is definitely a harder feel to it afterwards, which is a lot to do with the chalk paint as well as the wax. I hope you’re not too disappointed. If you do give it another go with a different wax, I’d love to know how it goes.